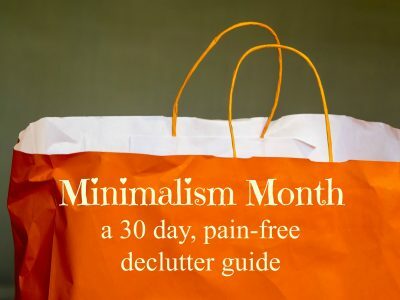 If you want to jump-start your journey to a more peaceful, simple home here is an easy declutter guide to help you shed some of the unwanted stuff and start enjoying the empty spaces left behind! Each day, go through the items on the list and donate, recycle, or throw away. It won’t take long to see a difference in your living space! Day 1: Shoes that never fit quite right (it doesn’t matter how cute they are, if they don’t fit they WON’T fit! Say goodbye.). Day 2: Baskets that serve no purpose. More containers without a purpose just collect more clutter. Day 3: Old magazines (while you are at it, cancel your subscriptions!). Day 4: Books going unread (don’t own what you can borrow. Don’t borrow what you can read on your Kindle!). Day 5: The extra cups and mugs that don’t fit in the cabinet (keep your favorites, not all the promo mugs and gifted ones). Day 6: Extra hangers. (Hangers are an elusive category that I feel like I always need yet always have in excess). Day 8: Chipped or mismatched dishes. Day 9: Clothes that show significant wear (getting rid of old favorites allows you to find new favorites that aren’t so shabby). Day 10: Games that never/rarely get played (ditto to puzzles that are missing pieces or just don’t get love). Day 11: Anything that leaks or makes a huge mess. I’m looking at you, lifetime hair product collection! 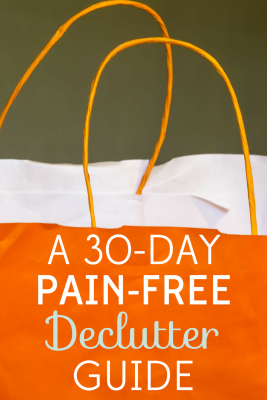 Day 12: Bags with broken zippers, holes, or straps that are close to breaking (just put it out of its misery and stick with a purse you can count on!). Day 14: Exercise gear that isn’t improving your health on a regular basis. (It’s now or never. Either plug it in and start sweating or put it at the curb). Day 15: Craft supplies that are so messy they are useless. (Random leftover items seldom become great masterpieces; more often they become discarded trash so just skip the in between stage). Day 18: Stray keys that have hung around for a year or so. If you don’t know what they fit, chances are you will never find out. Day 19: Nail polish that isn’t in prime condition (dry or just doesn’t give a good finish). The same goes to expired or less-than-fresh cosmetics. Day 20: Prescription meds that are no longer needed (I found multiple tubes of ointment for various unknown skin conditions. TOSS). Day 21: Scratched or damaged DVDs and CDs (if they are favorites….try this method to restore). Day 22: Raggedy or stained towels. Day 23: Last resort clothing. By last resort I mean, the items you don’t really like and only wear when everything else is dirty. Ditch them and wash a load of laundry, for crying out loud! Day 24: Broken Items in the back of the closet, waiting to be fixed. Day 25: Novelty & Event tees. Don’t keep them for sentiment’s sake; get rid of any shirts that aren’t flattering, in good shape, and say something you want to proclaim to the world. Day 26: Sample-size beauty products. Whether you found it in a magazine, received it at the dermatologist’s office, or “won” it at a Mary Kay party, just get rid of it. If you haven’t used it so far; you won’t use it at all. Day 27: Lightbulbs that don’t fit any current lights. (Don’t move lightbulbs or save them for future homes….discard them now!). Day 28: Excess giftbags. Saved gift bags inevitably become creased and squished. Keep a neutral roll of wrapping paper and eliminate the multiple bags and wasteful tissue paper. Day 29: Cleaning products that aren’t used or favored. I decided awhile ago that I was more likely to clean if I liked the product! One bottle of good multipurpose cleaner is better than half a dozen products that are collecting dust on a shelf. Day 30: Duplicates saved for back-up. My home had become engorged with back-ups, just-in-cases, extras, and saved-for-a-rainy-day items. I refuse to let my home be taken over again! You gave really amazing tips. I am very impressed with your tips. I really appreciate your work. I will definitely follow your tips. Thank you! Lots of great ideas to de-clutter here. Glad I found your site and have bookmarked you! Remember that prescription drugs that you are not using should be returned to the pharmacy rather than just tossing them out. Thanks, that’s a very good reminder. Sometimes police departments will hold events where you can drop off old prescriptions and they’ll safely dispose of them.